This Celtic goblet is a pewter vessel that features three embossed panels that depict the Irish legend of The Children of Lir. 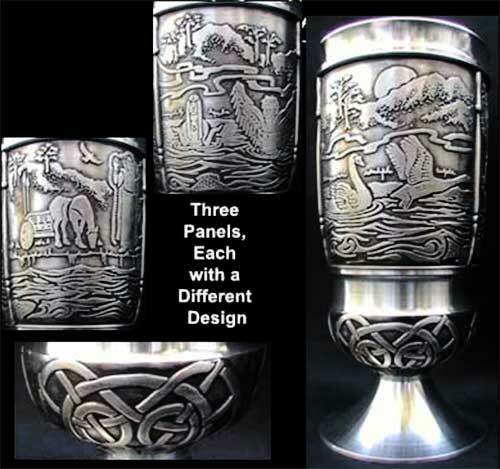 The Irish legend goblet is further enhanced with embossed Celtic knot-work below the panels. The pewter goblet holds 10 ounces and stands 6" tall. The legend is much loved when told to children. The events happened about one thousand years before the coming of St. Patrick. It is a story closely related to Mullingar as it occurred on Lough Derraghvarragh, one of the three lakes that surround Mullingar. The story begins with the defeat of the Tuatha De Danaan by the Gaelic people called Clanna Mhileodh. Now the Tuatha De Danaan believed in magic and practiced it. It was they who ruled over the land of Eire. After the defeat of the Tuatha De Danaan a king was elected. The contenders were Bodhbh and Lir. Bodhbh was elected and Lir flounced out of the meeting. The newly elected king forbade any harm come to Lir. Bodhbh offered his daughter Aodh to Lir in Marriage to renew their friendship and soon Aodh bore twins named Fionnuala and Aedh. Later came another set of twins Fiacra and Conn. Some years later Aodh died and the king offered his sister–in-law Aoife in marriage to Lir. The children grew to love Aoife as if their real mother, but as time passed Aoife felt that Lir gave too much attention to his four children. Now Aoife belonged to the Tuatha de Danaan and wickedly broke with tradition by using her own powers in an evil way. So she drove her chariot hard until she came to Lough Derraghvarragh near Mullingar. There the children jumped off and ran for a bathe in the deep waters of that beautiful lake. One by one, when they were swimming, Aoife cast a spell which turned Fionnuala, Aedh, Fiacra and Conn into beautiful swans as white as driven snow. That done she made the worst spell by sentencing her victims to three hundred years on the smooth surface of Derraghvarragh, three hundred more on the turbulent waters of the Sea of Moyle between Ireland and England, and the last three hundred at Erris in Mayo and an off-shore island called Inis Guaire. The deed done Aoife repented. Too late her magic could not undo the spell so the four swans were endowed with the powers of speech, intellect, music and above all their nobility. Lir travelled by horse to meet with Bodhbh. At a spot at Knockeyan on the shores of Lough Derraghvarragh he stopped to rest his horse. Hearing voices he observed four swans, in line, swimming hurriedly towards where he was standing. A swan spoke and he recognized the sweet tones of his daughter Fionnuala. The swan told him the whole story. A deeply troubled father, Lir continued on his way to the palace of Bodhbh. Being also a Tuatha De Danaan the king had a magical power in reserve. On hearing the story he used his power to punish Aoife. He turned the wicked woman into a demon of the air where she would remain without setting foot on land. The king came to live near the lake so as to be close to his children. A law was made that no one Eire must ever kill a swan and that law has been observed to this very day. The time passed conversing with the children and listening to their song. The four swans suffered a lot from hunger and cold on the open Sea of Moyle and when their three hundred years ended the children flew to the West of Ireland where they suffered just as miserable as at Moyle. A saintly man name Mochaombog came to the coast. He became friend of the lovely swans and cared for them at home. The King of Connaught came to take them for his queen but Mochaombog resisted. The Children of Lir ended their period of enchantment thankfully and the beautiful Fionnuala and her brothers Aedh, Conn and Fiacra resumed their human shape, were baptized by their saintly friend and died. Did it really happen? Well, we don’t fully know but every Irish Legend mixes truth with fantasy and somewhere in it there is a lesson for each generation on children. It’s a lovely story but a sad one too.